Canada's Prime Minister Justin Trudeau (R) shakes hands with Britain's Prime Minister Theresa May during a meeting in Trudeau's office on Parliament Hill in Ottawa, Ontario, Canada, September 18, 2017. 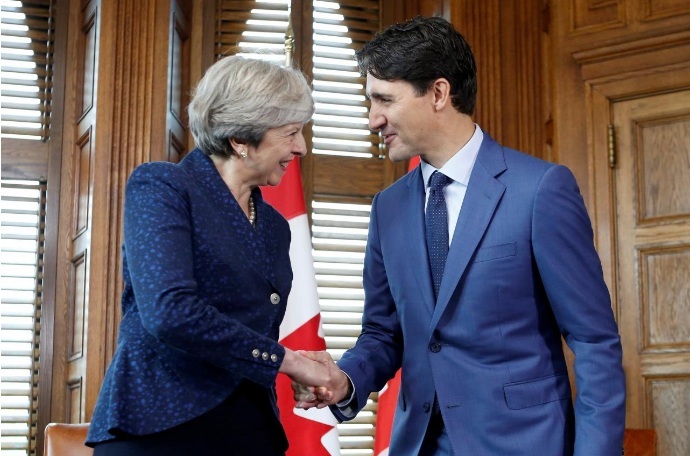 OTTAWA - British Prime Minister Theresa May said on Monday she would press U.S. President Donald Trump this week about a trade challenge by Boeing Co that could endanger thousands of aerospace jobs in Northern Ireland. British Prime Minister Theresa May said on Monday she would press U.S. President Donald Trump this week about a trade challenge by Boeing Co that could endanger thousands of aerospace jobs in Northern Ireland.